Fancy a night out in Bangkok? Bangkok Nightsonline slots casino game is for you. You have all the feel good features of a real night out with the dancing girls and their costumes. Set against a yellow sunset with dragons adorning the reels and with sultry eastern music in the background, you’re in for a treat. Founded in 1999, this UK headquartered company, NextGen Gaming has offices in Australia and Sweden. Although it has been around a while its name is not as well known as other developers in the industry. Its focus is on business to business transactions so they market games which are customisable by other more well-known companies. You’re likely to have played more NextGen games than you realise. 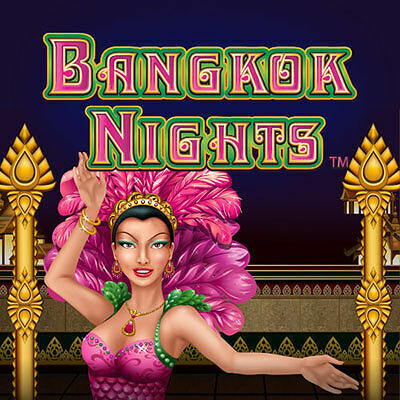 Bangkok Nights online slots has a 5 reel, 3row, 20 payline format. There arethe usual playing cards in this game at the lower end of the paytable, then there’s the show tickets, the hat and gloves, earrings and at the top of the paytable, the feather eye mask. Click Infoto read the game rules and paytable. Select the number of paylines you want to bet on (from 1 to 20) and then select your bet per line (from 0.01 to 5.00). Or click Max Bet to take you straight to the maximum if that’s what you want. You can play auto by clicking Autoplay and choosing a number of spins from the slider. You can stop at any time by clicking Stop Spin. DANCING GIRL –substitutes for any symbol except the scatter and triggers the pick and win bonus game if she lands on reels 1 and 5 in the same spin. Living up to her name she also dances briefly for you if she’s part of your winning payline. Triggered by three or more scatters appearing on adjacent reels left to right, you’ll earn 12 free spins during which any win is tripled. You can also earn more free spins if scatters pop up again. Triggered by the wild girl landing on reels 1 and 5 in a spin, you get to pick a symbol for a cash prize. If you don’t like the first prize you can forfeit it and pick the other. After any win you can pick a red or a black card to win or you can pick a card suit to win. With the red or black choice, you’ll either double your winnings or lose it. With the suit you’ll x4 your winnings or lose it. Bangkok Night’s online slots gameis easy on the eye and has some nice surprises in it. When you make a big win, you’ll see diamonds cascade across the screen. Very nice!